At SimpleLegal, half of our executive team and more than 65% of our hiring managers are women. My co-founder, Patrik Outericky, and I didn’t initially have a specific diversity goal around hiring. In the early days, just being able to hire at all — while simultaneously building a company from scratch — was hard enough. When you’re just getting started, the first step to a diverse team is to establish a welcoming environment where no one is made to feel like an outsider. An inclusive culture will start you on the path to building a company that can realize the rewards of a diverse team. My team and I strongly believe in the need to allow employees with a variety of viewpoints to have the space and freedom to express their opinions. Additionally, preconceived notions about stereotypes and roles can cause you to exclude promising employees from opportunities to excel professionally. At the most basic level, don’t assume that certain employees or candidates won’t want to travel, commute a far distance, work long hours, or that they’ll be any less dedicated to their career than anyone else. As a parent, I see this type of exclusionary stereotyping when I hear other founders talk about working hours, offsites, and after work activity expectations. Founders need to believe in the value of all kinds of diversity. Certainly there’s virtue in wanting to create opportunities for stereotyped, underrepresented, or otherwise marginalized groups. But, I truly believe in the value of leveraging a diverse set of thoughts and approaches to solve problems. This way of thinking allows us to view the notion of diversity as a specific problem to solve, rather than just an abstract cause to support. At SimpleLegal, we started as a group of white guys born in five different countries across three continents. Our first female employee joined as our 6th team member. During my first one-on-one meeting with her, I told her that if she ever felt uncomfortable she should come to me or Patrik right away and let us know. I was fairly certain we hadn’t hired anyone who would be overtly sexist, but I was also aware that there are a million ways to make someone feel unwelcome. I also knew that it would be somewhat awkward for her to report an issue to a member of the group that was causing the issue. But, at least by consistently speaking to the value of diversity and by providing more than one path to report an issue, I was able to reduce that awkwardness as much as possible. We’ve worked hard to make SimpleLegal a gender-diverse team by default, and we’re continuing to work hard to attract, retain and support people from as many different regions, races, ages and backgrounds as possible. We also look beyond SimpleLegal to demonstrate our belief in the value of diverse teams and to promote the value of diversity. 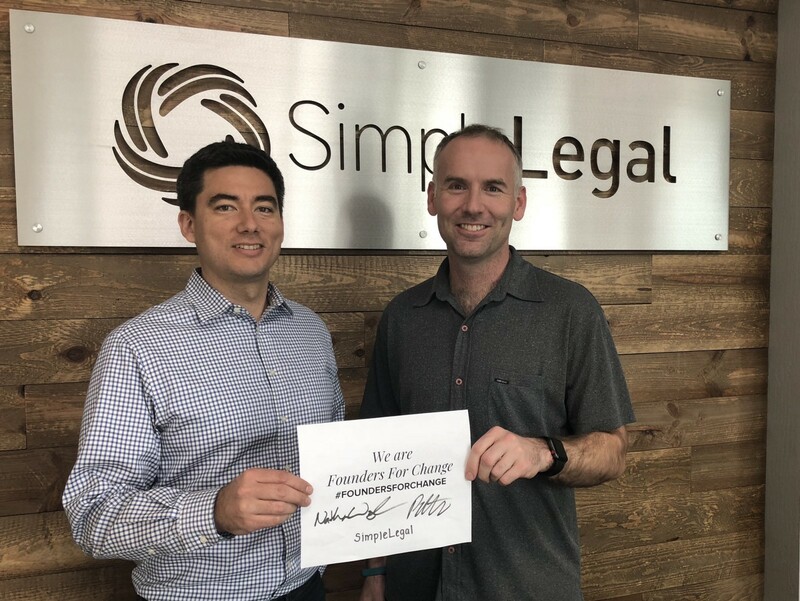 We were very excited to have joined the Founders for Change movement which aims to improve diversity and inclusion within venture-backed companies. Our membership in this group is important to me because when anyone is made to feel as though they don’t belong, I believe I have the opportunity and responsibility to raise my voice to counteract those who would shut people out. If you have a candidate pipeline problem, where and how are you recruiting? If you’re getting “nos” from candidates, how are you communicating your company culture and values? Are you creating an environment that might make some groups feel excluded? If your hiring team determines candidates are a “no,” what’s the interviewer’s specific feedback? Could they unintentionally be using a subjective measure of expertise or fit? Does “hiring for culture fit” mean your culture of work or does it mean a culture of like-minded friends? It’s easy to assume someone will be a “good fit” just because they look, talk, or act similar to everyone else. Culture is more than happy hours and offsites. Do your interviewers represent the diversity of the team you want to build? If the only people interacting with candidates are young, white men, odds are you’re going to continue to attract that demographic over others. At SimpleLegal, our goal is to ensure that everyone on the team feels like they belong and that all candidates see how they will belong. Having a diverse team means we can think about problems and solutions from different perspectives and contexts. It means we can successfully recruit from a larger pool of candidates. It means we will be able to more effectively relate to our customers and partners, no matter their background. Put quite simply, having a diverse team means we can win.